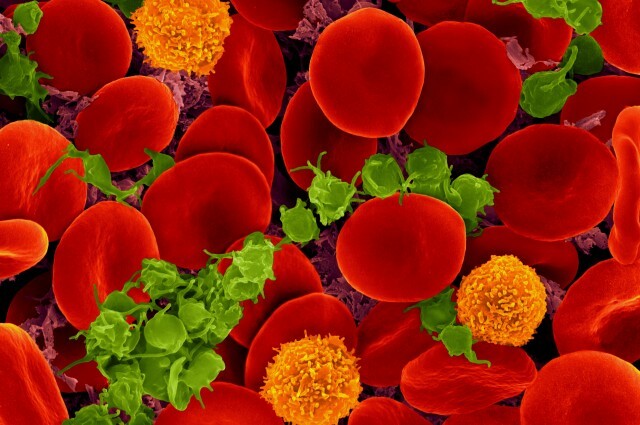 Human blood (red) and immune cells (green) are made from hematopoietic/blood stem cells. Photo credit: ZEISS Microscopy. Inflammation is the immune system’s natural protective response to infection and injury. It involves the activation and mobilization of immune cells that can kill off foreign invaders and help repair damaged tissue. At the heart of the inflammatory response are hematopoietic stem cells (HSCs). These are blood stem cells found in the bone marrow that give rise to all blood cell types. Under normal conditions, HSCs lie in a dormant state. But in response to inflammation they are triggered to rapidly divide and to differentiate into the immune cells needed. This initial response is beneficial in fighting off infection, however if left on for too long, HSCs lose their ability to self-renew (or make more of themselves) and regenerate a healthy blood system. IL-1: Good Cop or Bad Cop? A key player in the immune response to inflammation is a cytokine protein called Interleukin-1 or IL-1. It plays a beneficial role during an initial or acute inflammatory response: IL-1 along with other pro-inflammatory cytokines signals to HSCs that inflammation or infection is occurring and recruits certain immune cells from the blood into the tissue where they are needed. However, IL-1 can also have negative effects on the immune system and high levels of this cytokine are found in patients with chronic inflammatory diseases such as obesity, diabetes and atherosclerosis. When HSCs are exposed IL-1 for long periods of time, they lose their regenerative abilities and overproduce specific types of aggressive immune cells called myeloid cells that are needed to fight infection and repair injury but can also cause chronic inflammation and tissue damage. This can create an imbalance of blood cell types that impairs the function of the immune system. So is IL-1 the good cop or the bad cop when it comes to inflammation and disease? A new CIRM-funded study from the University of California San Francisco (UCSF), published yesterday in Nature Cell Biology, might have the answer. The study was led by first author Dr. Eric Pietras, who is now an Assistant Professor of Hematology at the University of Colorado Anschutz Medical Campus. He along with senior author and UCSF Professor Dr. Emmanuelle Passegue, were interested in understanding whether IL-1 was a bystander or an active player in causing this transformation in HSCs that leads to chronic inflammatory disease. To answer this question, Pietras and Passegue exposed mouse HSCs to IL-1, both in a cell culture dish and in mice. They found that IL-1 drove HSCs to rapidly differentiate into myeloid cells by activating a molecular circuit directed by the PU.1 gene, which is important for regulating HSC blood production. However, when mice were exposed to IL-1 for an extended period of 70 days – to mimic chronic inflammation – their HSCs were no longer able to do their normal job of regenerating all the cells of the blood and immune system. I reached out to Dr. Pietras and asked him to explain what new insights his study has produced about the role of IL-1 during inflammation. There’s good news though. 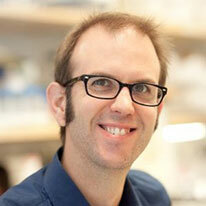 Pietras and his team were able to reverse the negative effects of chronic IL-1 exposure on HSCs by simply removing IL-1. They proved this by transplanting HSCs from mice that were chronically treated with IL-1 and then taken off the treatment for a few weeks into irradiated mice that had no bone marrow and therefore no immune system. The transplanted HSCs were able to repopulate the entire immune system of the irradiated mice and did not show any regenerative dysfunction due to previous IL-1 treatment. “An important dimension of our study is to show in principle that HSCs can recover their functionality and return to making a healthy and balanced blood system if you can give them a break from the constant presence of inflammatory signals. This tells us that the negative effects of chronic inflammation on HSCs can be largely reversed if you can provide them with a break from the constant ‘emergency’ state IL-1 makes them think they’re in. This could impact how we treat chronic inflammatory disease. So will drugs that inhibit IL-1 be a future therapy for patients suffering from chronic inflammatory disease? Anti-IL-1 drugs have been around for a while – one example is Kineret, which is an FDA-approved treatment for rheumatoid arthritis. But there are many other diseases caused by chronic inflammation that may or may not benefit from such treatment. Dr. Passegue, in a UCSF press release, explained that their study’s findings are important for determining how anti-IL-1 therapy could be beneficial for patients.